The American Bar Association Magazine attempts to predict the lawyers whom Sen. Barack Obama and John McCain are likely to appoint as Attorney General, Supreme Court Justices, Solicitor General, Homeland Security Chief and more. Cass Sunstein is on the list, but not as Supreme Court Justice -- he's tapped for the White House Domestic Policy Advisor. For Attorney General, the ABA names Eric Holder and Mass. Gov. Deval Patrick. For Homeland Security Director, AZ Gov. Janet Napolitano. 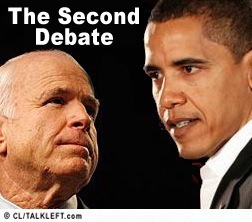 The Nashville debate between Senators Barack Obama and John McCain begins at 9pm ET on CNN. Big Tent Democrat, TChris, the TL Kid and I will be live-blogging. Sen. Barack Obama has released a new Spanish language ad on the economy in Colorado, Florida, Nevada and New Mexico. You can view it below the fold. The photo is a screen shot from it. 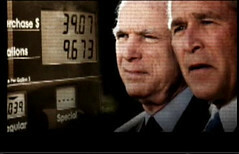 A companion radio ad (click here for audio) plays the same McCain "fundamentals" clip and later asserts, in the Florida version of the spot: "John McCain and the Republicans have no clue about the struggles of the middle class and working people. We have the highest unemployment in Florida in 13 years. Forty-five million people are without health insurance. Nine thousand five hundred homes are being foreclosed every day. In Florida, 1,400 families lose their homes on a daily basis. But John McCain and Republicans want to continue George Bush's same failed policies that led us to this collapse. How can McCain and the Republicans fix our economy if they don't know it's broken?" Three poll results are out today, showing a substantial convention bounce for Sen. Barack Obama and Joe Biden..
USA Today: Obama leads McCain by 7. Gallup: Obama leads McCain by 6. A CNN poll shows no bounce. The question is, will it hold and what will McCain's be? Gallup says McCain went up 2 points because of his choice of Sarah Palin as his running mate, while there was no increase for Obama selecting Biden. Some analysis of convention bumps is here. I like the Obama campaign's position that it is not interested in polls, only in the battleground states and getting out Obama voters. I've always thought the big battleground states are the key to this election. American likely voters say 55 - 27 percent that Arizona Sen. John McCain is better qualified than Illinois Sen. Barack Obama to deal with Russia and now trails the Democrat 47 - 42 percent, according to a Quinnipiac University national poll released today. This compares to a 50 - 41 percent Sen. Obama lead in a July 15 poll by the independent Quinnipiac (KWIN-uh-pe-ack) University.